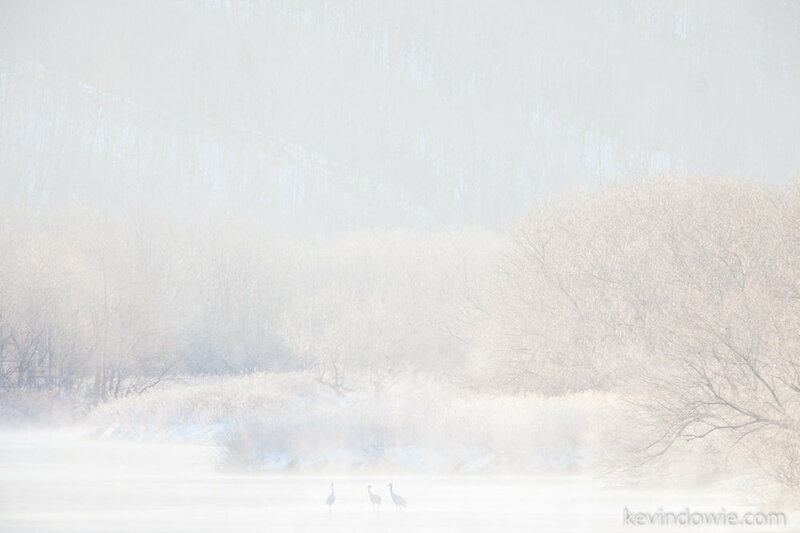 These are the Red-crowned crane (Grus japonensis), or Japanese crane, one of the largest of the world's crane species and a key reason for the wildlife/nature photographer to visit Hokkaido during the bitterly cold Northern Japan winter. The species is now rare with an estimated 2,750 in the wild, some in Siberia, Mongolia and the Koreas where they are migratory in habit, the 1,000 or so birds in Japan are considered to be a "resident" population. So small are the numbers, that the species was declared "endangered" in, 1970 and retains that status to the present.